CATCH THE BUZZ – New Sivanto Insecticide Safe For Bees, Hard On Pests, Good For Crops. A recent CATCH THE BUZZ blog about Bayer’s new insecticide product Sivanto® Prime (flupyradifurone) discussed the decision by officials in Kentucky to allow emergency use of this product to protect the sorghum crop from the devastating losses that otherwise are expected to occur later this year from sugarcane aphid outbreaks. The question was raised: that’s all well and good for sorghum farmers, but could use of Sivanto affect bees? A series of field and cage (bee tunnel) studies conducted in Europe showed that Sivanto when used according to the label has no adverse effects on honey bee colonies, including foraging activity, brood and colony development, colony vitality or overwintering success. A recent study by researchers at the University of Florida published in the Journal of Economic Entomology (https://doi.org/10.1093/jee/tow186) confirmed this by making applications at full bloom to buckwheat, a favorite crop of honey bees. The Florida researchers reported no harm to honey bee colonies as well as no change in abundance of foraging native bees and other pollinators. Dr. Joshua Campbell who led this research team as part of his post-doctoral research under the direction of Dr. James Ellis explained, “Our results indicated that SivantoTM is a promising systemic pesticide that has a favorable safety profile for honey bees and can be incorporated into integrated pest management programs for various crops in Florida.” For more on the University of Florida study, see http://blogs.ifas.ufl.edu/entnemdept/2016/09/15/field-study-new-pesticide/. 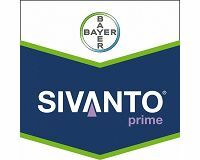 As an added precaution, the Sivanto label instructs growers to avoid applications when bees are actively foraging, but this novel insecticide will undoubtedly help address the concerns of farmers and beekeepers, alike.